I used to be a prop person- meh, I still am. I think what made me a good prop person was my love of…just, stuff…One of the coolest things I think is ephemera. The luggage tags and post cards and ticket stubbs and dance cards and old valentines and notes scrawled on the backs of receipts or business cards that people tuck into books, dictionaries, the linings of train cases only to be unearthed generations later sometimes by grand children, sometimes by strangers curious as to the previous lives of an item they may have bought or inherited. One of my personal favorites is an old LAX space-agey luggage tag I have tucked away….somewhere….but now! NOW! I had no idea these even existed! 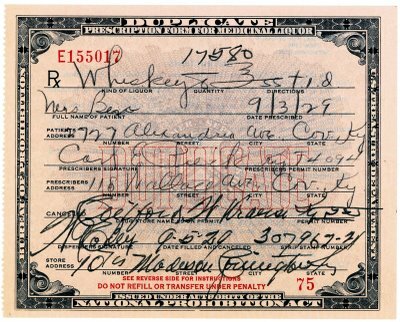 Prescriptions for whiskey from the prohibition era. I saw one that had a nice note from the doctor suggesting the pharmacist give the intended patient only ‘the finest available’. But now I can’t find it. Perhaps if you have someone in your life who enjoys whiskey, this might make a nice gift.